The President says the "system failed in a potentially dangerous way." What went wrong and how will he fix it? We'll talk to the Washington Post's Bob Woodward to get some perspective on how Obama is handling the terror threat and how he compares with his predecessors. Plus, former Homeland Security Secretary Michael Chertoff and former Director of National Intelligence John Negroponte join Larry. How would they have handled the situation differently? Is Joan Rivers A Security Threat? Joan Rivers says she was not permitted to board her commercial flight from Costa Rica to New York on Sunday because of her "suspicious" passport. Her seat was given away and she was told she couldn't fly. Find out what happened next and whether this can happen to you! How do you think President Obama is responding to the foiled Christmas Day terror attempt? GOP In-Fighting, Tavis Smiley & Bob Woodward! Tonight ... Is it all-out war within the GOP? Are Rush Limbaugh and GOP Chairman Michael Steele fighting for control of the party? Steele says he has "big plans" to shake up the GOP. Will he succeed in building a winning strategy in time for the next election? Larry's political panel talks about it tonight. WE WANT TO HEAR FROM YOU! Comment HERE and tune-in tonight! We just may use your comment on the air! Also tonight, Tavis Smiley and Bob Woodward join Larry to talk politics and the state of our nation. It's all tonight on "Larry King Live," at 9 p.m., ET. By Bob Woodward of the Washington Post – Woodward will be our guest tonight – what do you want to hear from him? Let us know! 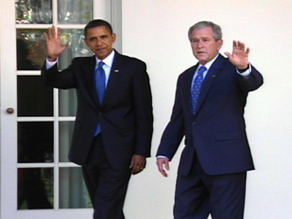 There's actually a lot that President Barack Obama can learn from the troubled presidency of George W. Bush. Over the past eight years, I have interviewed President Bush for nearly 11 hours, spent hundreds of hours with his administration's key players and reviewed thousands of pages of documents and notes. That produced four books, totaling 1,727 pages, that amount to a very long case study in presidential decision-making, and there are plenty of morals to the story. Presidents live in the unfinished business of their predecessors, and Bush casts a giant shadow on the Obama presidency with two incomplete wars and a monumental financial and economic crisis. Here are 10 lessons that Obama and his team should take away from the Bush experience.